Aer-Max is the most effective closed-tank aeration system available for the treatment of iron, hydrogen sulfide, and manganese in residential well water. When used with an appropriate filter, it can eliminate large amounts of these contaminants without chemicals or oversized retention tanks. Aer-Max provides a more aggressive aeration treatment for problem contaminants than the simple inline venturi systems or “single tank” treatments that use the same tank for aeration and filtration. 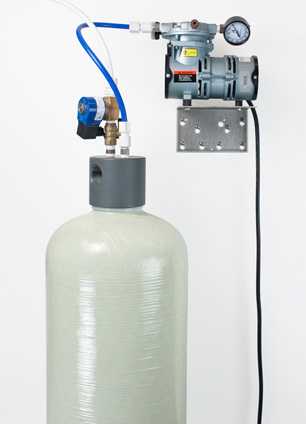 An Aer-Max unit consists of three parts: a treatment tank (standard residential size is 10" by 54"), an air pump (compressor) to inject air into the tank, and a venting system to promote air circulation and replacement within the tank. The Aer-Max system must be followed by a filter to complete the removal process. Filters are sold separately. When the air pump runs, it injects air into the treatment tank and forms a pocket of compressed air in the top third of the tank. Water on its way to the home or other point of use enters the top of the tank and sprays down through the air pocket where contaminants are “oxidized,” turning ferrous iron (clear water iron) to ferric iron (red water iron) and hydrogen sulfide to elemental sulfur, making them easily filterable. The oxygen-rich water works its way to the bottom of the tank where it is collected and sent out to the next step, filtration, where the precipitated contaminants are removed. Whether iron, manganese, or hydrogen sulfide is being treated, the Aer-Max unit must be followed by a filter to remove the oxidized contaminants. 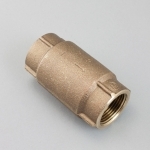 When treating hydrogen sulfide alone, either a backwashing filter or a cartridge style carbon block filter will work, but with iron and manganese, a backwashing filter is normally used because filter cartridges will clog and need frequent replacement. The Standard Aer-Max unit, followed by a backwashing filter to remove oxidized contaminants. The Aer-Max unit, followed by a filter, is installed downstream of the well's pressure tank and before a water softener or ultraviolet unit. No pretreatment is necessary, but the Aer-Max can follow a feed pump injecting chlorine or other oxidizers or pH amenders. If the water is very dirty, putting a sediment filter in front of the Aer-Max is wise. Voltage. Both the air pump and the solenoid valve that controls the vent must have electricity. Aer-Max is available in both 220 and 115 volt formats. 115 volt is most common. 220 volt is used if the air pump is wired into the well pump's electrical circuit. Pump-mount choices. 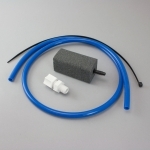 Installation kits allow the air pump to be mounted either on a wall near the treatment tank or vertically on top of the treatment tank itself. 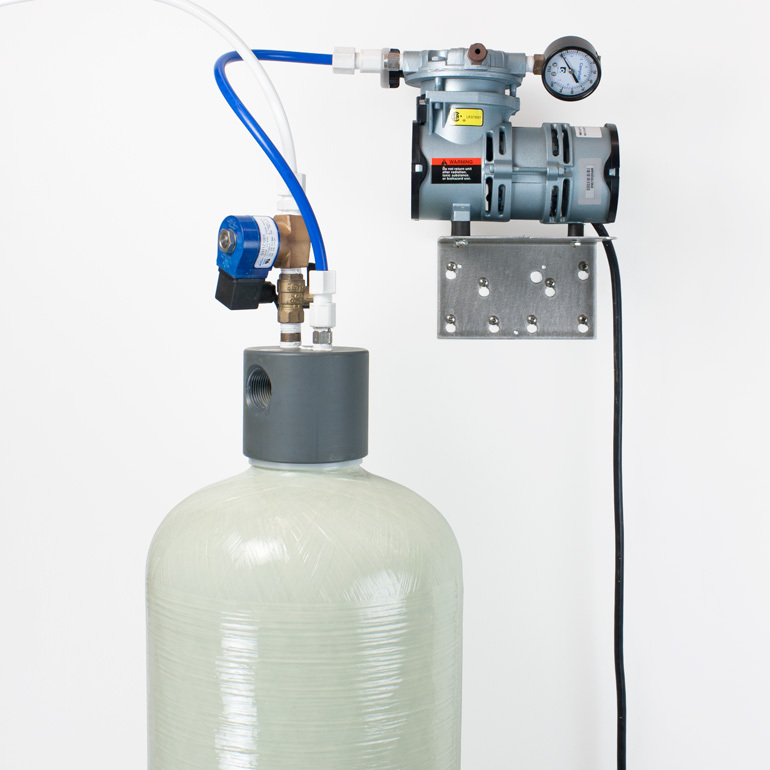 The image above shows a standard system, with the air pump wall mounted slightly above the treatment tank. 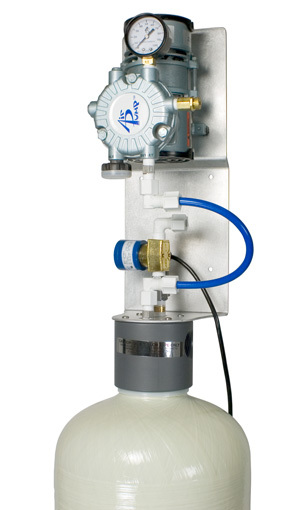 The new Deluxe Tank Mount system with vertical, on-the-tank pump mounting is the easiest and the most compact installation. See image at right. When used with the timer, no electrical wiring is needed. Just plug the pump and vent system into the timer, and plug the timer into a 115-volt wall receptacle. Pump control. For normal residential use, the air pump does not run continuously and it does not even need to run while water is being treated in the tank. 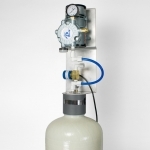 The air pump only needs to run enough to keep the air pocket in the treatment tank fresh. This can be as little as ten minutes every two or three days. The standard way to turn the pump off and on is to wire the pump into the electrical circuit that controls the well pump, so that the air pump runs when the well pump runs. Alternative methods are to use a flow switch, which activates the air pump when water is running to the home, or a simple timer that turns the pump on and off at preset times. The easiest installation is with the timer. More details on pump control. Note: The systems below are complete with air pump, 10" x 54" aertion tank, 1" vent head, check valves and other accessories, pump mounting shelf, all tubing needed, Maxi-Vent system, and internal tank accessories. Complete instructions are provided. 115 Volt Aeration System. Consists of 115 volt air pump, 115 volt Maxi-Vent, 10" X 54" aeration tank with vent head, plus all needed accessories for installation. Use this voltage if installing with a timer or flow switch (see 115 volt control options). Everything needed to install the 115 volt vertical tank-mount Aer-Max system. Use this voltage if installing with a timer or flow switch (see 115 volt control options). 220 Volt Aeration System. Consists of 220 volt air pump, 220 volt Maxi-Vent, 10" X 54" aeration tank with vent head, plus all needed accessories for installation. Use this voltage if the pump is to be wired into your well pump's electrical circuit. Everything needed to install the 220-volt vertical tank-mount Aer-Max system. Use this voltage if the pump is to be wired into your well pump's electrical circuit. Note: Since iron oxidizes very quickly when exposed to air, it can quickly stop up emitters in the double aeration system. Double aeration, therefore, should not be used if there is even a small amount of iron in the water or if the water is very hard. 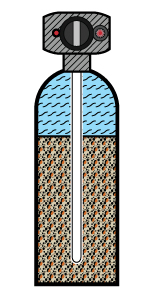 Double Aeration releases air through a “fish stone” emitter deep in the aeration tank to enhance performance in hydrogen sulfide reduction. This optional upgrade can be added to any Aer-Max system. This is a simple timer that turns the air pump on and off at intervals set by the user. Buy the 115-volt Aer-Max if you are installing it with the timer. 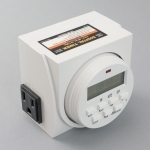 Use of the timer provides the easiest installation of all with no electrical wiring required. Aer-Max works excellently in front of all standard iron filters, greatly enhancing their performance. For iron removal, a backwashing filter must be used and the pH of the water must be sufficient for the filter medium. (Some media are effective at lower pH than others.) The filter required depends on the amount of iron being treated, the service flow required, and the pH of the water. If the pH of the water is 7.0 or higher, virturally any granular filter medium will remove a significant amount of iron (3 or 4 ppm, for example) after the water has been pretreated by Aer-Max. Typical media in this class are Filter Ag, GAC, sand (Multi-Media), or natural zeolites like Zeolite or Micro-Z. Calcite can be used to raise pH and at the same time remove small amounts of iron. With larger amounts of iron, it is best to use one of the specially designed iron-reduction media. Birm, the simplest and least expensive of these, works well if the pH is 6.8 or higher and if iron levels don't exceed 6 or 8 ppm. With lower pH and with higher iron levels, more aggressive iron media like Katalox Light and Filox work best. Aer-Max does not treat hydrogen sulfide odor the same way as open air tanks, which vent the offending gas so that it escapes to the atmosphere. Aer-Max “oxidizes” the contaminant, converting it to elemental sulfur, so that it can be easily removed by a filter. The best filter for the job is carbon, and the specialty carbon called “catalytic carbon” (Centaur or Aquasorb), is the top performer, but when treating the odor alone (when no iron or manganese is present) almost any filter, including a wound string or spun “sediment” filter, can be effective. Carbon block filters work well after Aer-Max if no iron is present. Backwashing carbon or catalytic carbon filters are superb hydrogen sulfide removers after Aer-Max. Virtually any amount of hydrogen sulfide can be treated with Aer-Max followed by carbon. With amounts above nine or ten parts per million, however, a treatment tank larger than the standard Aer-Max 10" X 54" is recommended. When removing both odor and iron, a backwashing filter must be used. Most filter media that work for iron will work for hydrogen sulfide as well. An exception is Birm, which is not recommended for use with hydrogen sulfide. Both Filox and Katalox Light work well with both odor and iron reduction. Catalytic carbon is excellent for iron and hydrogen sulfide treatment if iron content is 2-3 ppm or less. Manganese removal can present special problems. If manganese is present with a larger amount of iron, removal is usually easier. If a significant amount of managanese and little or no iron is present, removing manganese can be a challenge. In general, manganese is removed like iron, but the pH needs to be higher — 8.0 to 8.5 with some media. As with iron, dissolved oxygen needs to be sufficient. Aer-max, of course, solves the oxygen issue, but you may have to raise the pH and use a vigourous medium like Filox or Katalox Light to assure a good result with manganese. Although ion exchange water softeners are often very effectively used to reduce iron, they are not iron filters. They remove iron by ion exchange — the same way they remove hardness — not by filtration. If you are treating iron with a water softener, placing an Aer-Max system in front of it will actually interfere with the softener's ability to remove iron. This does not mean you can't use both Aer-Max and a water softener, but you must use a filter in front of the softener. Thus, the best way to treat both iron and hardness is to use Aer-Max, then an iron filter, then a water softener. The same is true with hydrogen sulfide treatment. The best treatment for iron bacteria is chlorination, either in the well or on the surface. Aeration is not an effective treatment for iron bacteria. However, Aer-Max is completely compatible with chlorine, so you can send the chlorinated water through the Aer-Max unit. Keep in mind that the iron or hydrogen sulfide filter that follows must be chlorine tolerant. Birm is not, but most iron and sulfide media are. Carbon is excellent, and it will get rid of the chlorine after it has done its job. 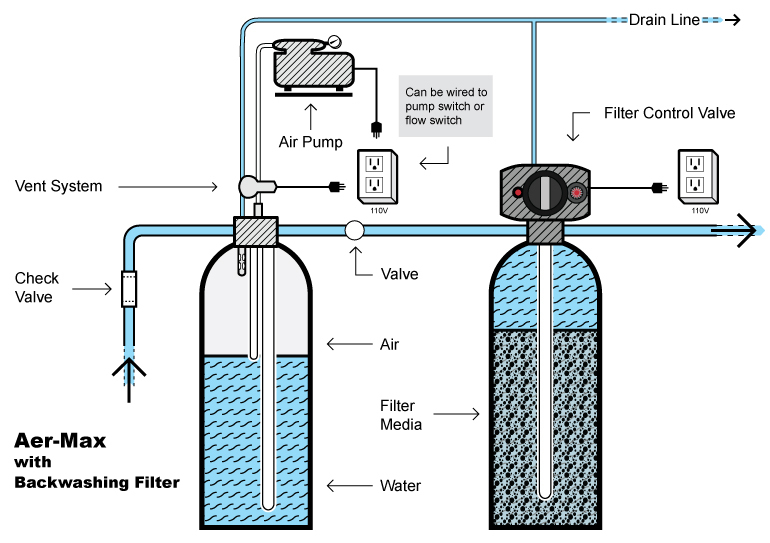 There are many options for filters that can follow an aeration system. Follow the link for some advice on treatment and some suggested filter options. Parts for your existing Aer-Max System. 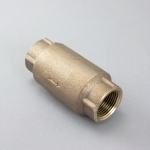 Replacement pumps, solenoid valves & misc parts are all available on our aeration parts page. Single Tank Aerators are unique aeration systems that perform both oxidation and filtration in the same tank. When contaminant levels are low they are a great alternative to Aer-Max.